Some days I wish I was old enough to say that I remember the days when melodrama and horror were almost interchangeable terms. 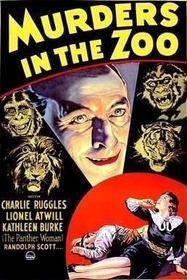 I'd point out a few key examples: Secret of the Blue Room, The Vampire Bat, and this little number, Murders in the Zoo. Containing as much drama and suspense as it does horror, it remains one of the more effective unsupernatural terror films of the early 30s. Lionel Atwill plays Eric Gorman, adventurer, gamesman, philanthropist, psychopath. Actually, he wouldn't be so bad if his wife wasn't so beautiful and so many other men didn't hold the same opinion. Lucky for him, he's quick, resourceful, and a needlepoint expert. From the first gruesome scene (quite a shock even 68 years later) to the climax, he is one of the silver screen's more effective human monsters. Unfortunately, this being a 1933 film, we are also dealt a comic relief press agent, Peter Yates (Charles Ruggles, who receives top billing). Yates has some funny bits, but he's a distraction. I would have appreciated lots more of Gorman... perhaps a couple more animal style killings. As it is, the film runs just over an hour, and the full possibilities of Gorman's psychosis are not played out. I recommend this film, highly, because Lionel Atwill is a brilliant character actor, and does some of his better work here. The supporting cast is competent, the direction slightly above par, and the writing about average for the era. With the short running time, you could even double feature this with another one of Atwill's early 30s horror flicks. Submitted by Thomas Morton (not verified) on Wed, 2015-03-25 16:42.